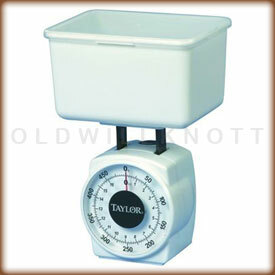 Scale Size 7.5" x 7.5" x 3.5"
The Weighing Container Does Double Duty! With this scale, you can easily weigh your food portions for meals and recipes and when ya aren't using the scale at all, it fits nicely inside the weighing container for storage. It takes up about as much room as a regular old coffee mug. Tare Knob This diet scale has a handy little tare knob on the back that let's ya set the scale's dial back to zero after putting something on the scale. This is great for using the included weighing bowl, or if ya want to get separate weights of different items. Dual Reading Dial Doesn't it get on your nerves when one recipe calls for ingredients in grams and the next recipe calls for ingredients in ounces? Well with this food scale, that won't be a problem. The dual reading dial on the Taylor 3720 displays your weights in both grams and ounces simultaneously...you'll never have to worry about switching back and forth between units again. 5 YEAR MANUFACTURER'S WARRANTY! Taylor provides a five year warranty on this mechanical food scale. So, if ya have a problem with the 3720 within the first five years ya own it, just send it to the Taylor warranty center. They'll fix it or replace it and send it right back to ya. Got this to help me lose weight about a year ago. I weigh out portions all the time and this little scale does a fine job. Who needs a fancy digital gizmo when you can get this thing for next to nothing? I like the size of this scale & that it's neat & tidy. It's a little small & awkward for weighing more than 1 oz or so at a time, so I actually don't use it that often. Also, it was hard for me to get the balance calculated to be a true zero. The price was right, except that S&H cost more than the scale! Delivery was timely. I think if I purchase another scale, it will have to be a little larger. I bought this because I've been trying to portion my food properly and this really helps when all it says is that one serving is an ounce or two. It's great and I love it. I also love how it was pretty inexpensive. This is a great scale easy to use and care for. Great price too I would recommend it to anyone needing a convenient and easy to use kitchen scale. Thanks for making your product affordable.